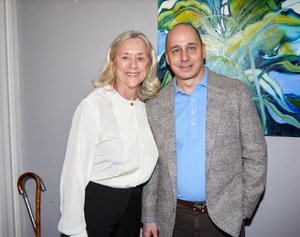 Family Centers celebrated the start of a new Major League Baseball season at an intimate breakfast fundraiser featuring New York Yankees General Manager and Darien resident Brian Cashman on Friday, Feb. 8. Held at the Darien home of Jan and Bob Dilenschneider, the event directly supported Family Centers’ network of health, education and human service programs that assist more than 21,000 Fairfield County children and families each year. During his remarks, Cashman described how he started as an intern in the Yankees organization and rose to become one of the longest tenured General Managers in team history. He also offered his outlook on the Yankees' 2019 campaign and provided first-hand perspective on the team's off-season moves. Special guest Mark Teixeira, a former Yankees first baseman and member of the 2009 World Series Championship team, was also on hand to answer questions and meet with attendees.